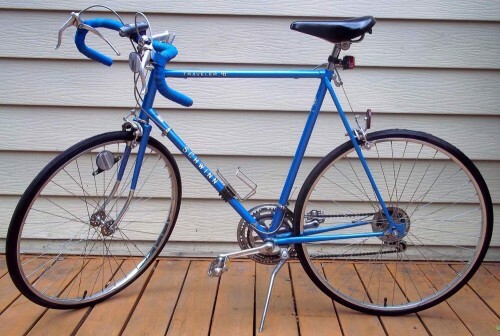 Gman’s 1978 Schwinn Traveller III. This concludes our Celebration of Independence. The rest of the week is TBD, but I do have hopes of posting much due OTSOTM—fingers crossed. 26-inch bike I picked up outside of Milwaukee last year and imported to IL. Just put new tires, rear brake pads, and padded handlebar tape on it. Rides great. Nice Traveller, Gman! Looks great! By the way, the front reflector is upside-down, but since we recently celebrated our country’s freedom, I may be accused of being too critical of your ‘free expression’, meaning MY ‘free expression’ has its limits.